Although it is possible to construct the Kitchen Garden Cloche yourself, we recommend having a second person to assist with the main cover. Components: End Section (2), Main Cover (1), Cross Bar (1), Handle (1), and Black Bolts (12). 1. Place and End Section on the floor or table, and slot an end of the Main Cover into it. The metal strip on each side of the Main Cover will slot over the bottom of the End Section. 2. Attach with four (4) bolts in the order shown in the picture. 3. Repeat Step #1 at the other end of the cloche. 4. Attaché Cross Bar INSIDE the cloche with one (1) bolt to the top of each End Section. 5. Attach the Handle to center of Cross Bar using two (2) bolts screwed in from the inside. Assembly Complete! 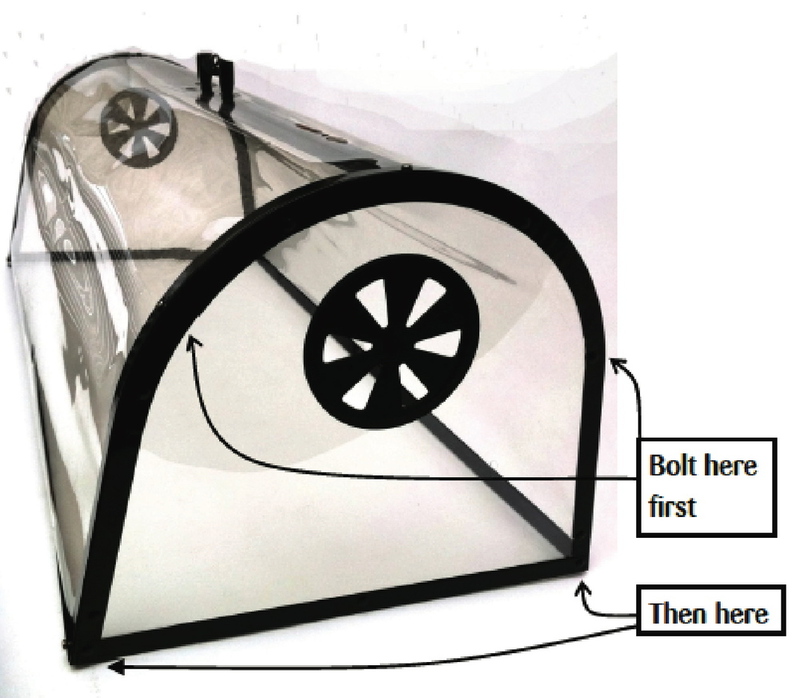 Our Kitchen Garden Cloche is made from galvanized steel and UV-resistant polyester, which we hope will bring you many years of immense satisfaction. Your Kitchen Garden Cloche can be cleaned with warm, soapy water.